Get A FREE Milo Shaker With MILO® 3-In-1 Easy Cool! You are here:Home » Product Reviews » Get A FREE Milo Shaker With MILO® 3-In-1 Easy Cool! 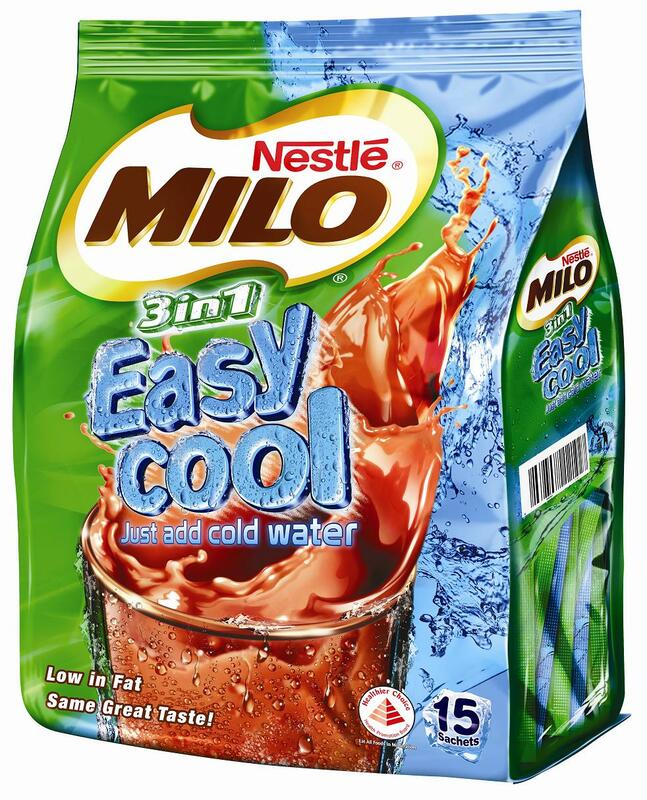 Nestlé Singapore launches a brand new product under Singapore’s much loved beverage, MILO® Easy Cool & I got to sample the product! Hey, Milo even included a shaker that comes with an indicator pointing how much water to add! That's so cool! Just as its name suggests, MILO® Easy Cool is all about bringing ease to the preparation of cold MILO®. All you have to do is – "Pour, Shake, & Be Cool!" Step 1: Empty 2 sachets of Milo into shaker. Step 2: Just add icy cold water up to indicated level. drink your favourite Milo straight from the shaker! With MILO® Easy Cool’s healthy offering of convenience – now you can enjoy the delicious & healthy much-loved beverage any day, any time. MILO® Easy Cool is now available at all leading supermarkets & hypermarkets such as FairPrice, Cold Storage, Shop N Save, Giant, Carrefour & Sheng Siong. It is retailed at S$6.30 per pack of 15 sachets. In the month of February 2012, MILO® Easy Cool is running a special Facebook contest with huge prizes such as an iPad2 & a Sony PS Vita for users who submit their own videos demonstrating how “It’s So Easy to be Cool- If You Know How.” Simply log on to www.facebook.com/milosingapore & click on the “Easycool” tab to watch amazing videos showing simple ways to do everyday things. The contest ends on 28 February 2012. There’s also a special banded promotional pack from now till end Feb 2012, where consumers are able to get a FREE MILO® Easy Cool shaker bottle- Just Pour, Shake and Be Cool! Cool! I love the shaker. And this Milo Easy Cool can even use cold water to mix. Great, now i can have my favourite Milo dinosaur in no time. Yeah! Doris, the shaker is awesome! Fixing this Milo Peng is as easy as ABC! Ann, even kids can fix their own Milo now. No excuse to be lazy. Lol! When I was young, Nestle had similar shaker for ice coffee in India, and we loved getting the coffee packs just for the shaker.. and the advt on TV ran with a song shake shake shake your cup...We were allowed coffee when we were young, Thanks to no TV or internet, my kids feel I belong to ice age as no TV or no NET.. how did we survive. Milo shaker looks great. Ash, coffee from young?? U sure are well-trained. Hahaha! My family doesn't drink coffee, so Milo is a good alternative. The ad sounds so fun! Hahaha! We have that in Malaysia too! :D It's super convenient cos I love cold drinks! Ha-I live about 1 hour from nowhere, so it will probably be some time before I see this drink mix showing up at the grocers! Never heard of this drink, it does look like it would be a great pick me up though. This is awesome, but we don't have this in the US! awww. i love MILo! iced or hot, they're just stress busters! loved the shaker! two sachet for one drinks? hmm, wouldn't it be too sweet? I think we had something similar like this before here, also from Milo. Hope this free shaker will reach our ground bc my nephews will simply love it. For me, Milo is when I am sick to booze up my energy. Charmaine, I love it too! Charles, I started drinking Milo since I was a kid. Never stopped loving it! Jay, I'm sure u'll like it! Fish, not at all! Rich & tasty! My hubby still enjoys mixing up his chocolate milk after dinner :) He would love this...such a big kid! Lizzy, hahaha! The shaker is a fun toy for the entire family! Kristy, hahaha! It's a great chance for me to try this shaker :) Loving it! I bought this easy cool Milo pack with the shaker. Had make and it taste super yummy. Thanks for the recommendation. Doris, that's great! Have fun! Zazabong, our entire family is having fun with the shaker. Hahaha!